I'm trying to identify a game I remember from the 1980s. The game was shown from a bird's-eye viewpoint (or maybe isometric? ), on Apple IIe, IIRC. 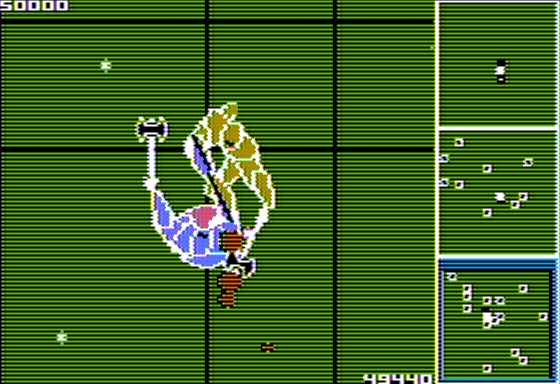 You controlled a guy with an axe, who was constantly walking forward, but you could rotate him left or right. So was the other player. You had an axe in one hand, and each time you swung the axe through the other player, you damaged him - this was shown as darker area (and would eventually kill him, winning the match). If you got to one side of the screen it, would scroll (as only part of the playing area was shown at any time on the screen). There were also (one or more?) flying discs, and if you stepped on one, you would fly forward at much higher speed (which could work for you, or against you, depending how good you were). I think you could choose whether you wanted to play against another player or against the computer. Does anybody remember the name of this game? But here's a screenshot with axes, a flying disc, and blood. Here's a clean crack (playable in-browser), a video of the game and an interview with the author. This was a controversial game at the time, and possibly influential. John Romero is apparently a fan. Not the answer you're looking for? Browse other questions tagged apple-ii identify-this-game or ask your own question.